BitFenix announces that it has upgraded its Shinobi, Shinobi Window and Colossus Window cases with USB 3.0. These three cases are now shipping with two USB 3.0 ports and two USB 2.0 ports. 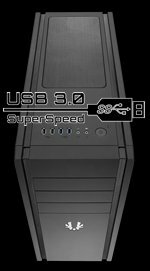 BitFenix is pleased to announce that two of our most popular chassis, Shinobi and Colossus Window, are being upgraded to SuperSpeed USB 3.0. With this new upgrade, users will be able to connect their SuperSpeed devices right out of the box and enjoy enhanced speed and performance. "Our vision is one of constant improvement," says BitFenix Product Manager David Jarlestedt. "This latest upgrade for our award-winning Shinobi and Colossus Window brings these models to the world of USB 3.0 for added flexibility and performance for BitFenix fans." Winning a combined 80 awards and positive reviews worldwide, these two models are some of the most celebrated PC cases on the market today.